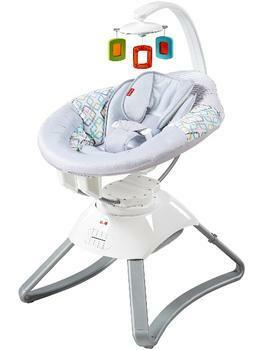 Fisher-Price of East Aurora, N.Y., is recalling about 65,000 Soothing Motions Seats sold in the U.S., and Canada. The motor housing can overheat, posing a fire hazard. The company has received 36 reports of the product overheating, including one report of a fire contained within the motor housing. No injuries have been reported. This recall involves Fisher-Price Soothing Motions Seats with model numbers CMR35, CMR36, CMR37, and DYH22 and Smart Connect Soothing Motions Seats with model number CMR39. The seat bounces, sways, or bounces and sways together, vibrates, plays 10 songs and nature sounds, and has an overhead mobile. The model number is located on the underside of the motor housing. The infant seats, manufactured in China, were sold at BuybuyBaby, Target, Toys R Us, Walmart and other stores nationwide and online at Amazon.com and other websites from November 2015, through October 2017, for about $160 for the Soothing Motions Seat and $175 for the Smart Connect Soothing Motions Seat. Consumers should immediately stop using the recalled Soothing Motions Seats and contact Fisher-Price for a full refund. Consumers may contact Fisher-Price at 800-432-5437 from 9 a.m. to 6 p.m. (ET) Monday through Friday, or online at www.service.mattel.com and click on Product Recalls & Safety Alerts for more information.